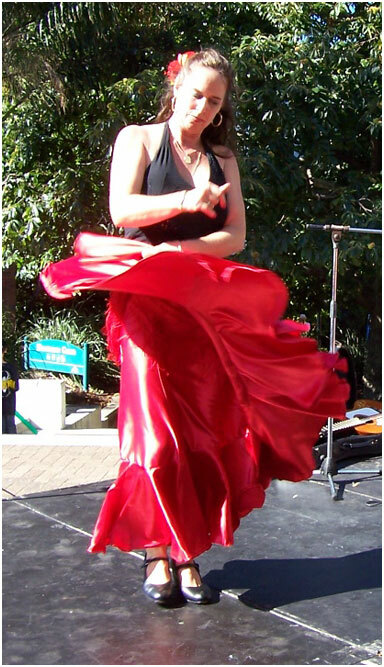 Flamenco NZ, founded by Maria Elena in 1993, is located in Auckland, New Zealand. It was set up with the aim to promote the Art of Flamenco in New Zealand in all its forms. Flamenco NZ has a fun and vibrant School of Spanish Arts, offering classes in Dance, Guitar, Singing, Cajon and Palmas. Flamenco NZ also organises performances, creative concerts, workshops and lectures about Flamenco. Flamenco NZ acts as an agency offering local and foreign talent. Flamenco NZ would like to extend a warm welcome to anyone who wants to learn or is interested in Flamenco, whether it be for fun, professional or fitness. Bienvenidos ! Maria founder of FlamencoNZ, has from a young age dedicated her life to the Flamenco Arts. Originally from Holland Maria moved to New Zealand in 1983. Over the last 15 years she has produced, directed and choreographed numerous Flamenco concerts. Kay Brown has dedicated many years to the Art of Flamenco Dance as well as Greek Gypsy Dance. She has been involved extensively with coaching Maori Kapa Haka in the past. She is a patient and friendly teacher.